Join the Peoria Area Chamber of Commerce, CEO Council, Peoria Area Convention & Visitors Bureau and Greater Peoria Economic Development Council for the first installment of "Morning Mash-Up: Your Community Toolkit". 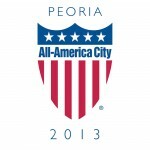 This is an event for all HR recruiters and marketing professionals that are on the front lines of selling Peoria. The goal is to make everyone aware of all the tools available and share the same message to those who are recruiting. Can't make it on February 12? Sign up for the March 14th section here. Free, but registeration is required.